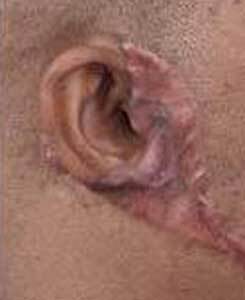 Keloids in the Ear: Keloids in the earlobe or Excessive Scarring in the Earlobe is a fairly common thing among keloids and scarring in the earlobe. The other common areas for keloid scarring are the shoulders, and chest | sternal area. These are areas where there are areas of tension. 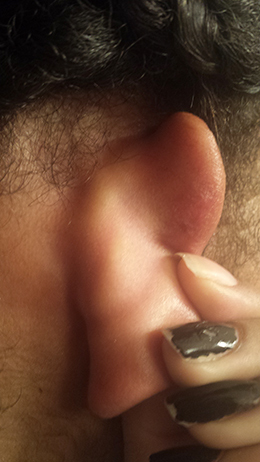 Correcting Keloids are very difficult. In the past, radiation therapy was done, excisions, etc. Many times they would reoccur. The best treatment nowadays is the excision of the keloids followed by serial injections of steroids. 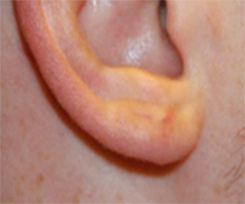 Serial injections of steroids means that we will bring you back every 2-4 weeks to inject the earlobe with steroids. 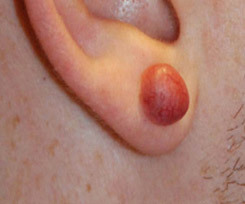 This can occur for 3-5 months until we are sure that the keloid has less of a chance of coming back. Why do keloids form? It is thought that there is some interaction of the skin cells (Keratinocytes) with the cells in the deeper tissue (Fibroblasts). Through an abnormal secretion of growth factors from the Keratinocytes to the Fibroblasts, the fibroblasts are stimulated to produce more collagen. It is thought that evolution may have a role in all this. In the past, there were tribes that revered scarring as a sign of strength. Tribes in Africa, would create scars in the chest and other areas and the males that would form the most scar there would be considered the strongest or have special powers and were given more respect. See Dr. Young’s Peer Reviewed Paper Published in the American Journal of Cosmetic Surgery: Treatment of Large Keloids With Secondary-Intention Healing.